← Nymeria has been spotted! Now, I don’t know about you, but I love being right. I love being the person who has the correct answer; the one who picks winners. (I still can’t figure out sports though, I’ve gotten every World Cup Final wrong.) Even when it comes to comics I love to be the person who knows what plotline will work, which author will do a great job on what books, and even which books will succeed. Having said that, I have never before been so happy to be completely and utterly wrong. Back in 2007, as a comic book rookie, I was wandering through poorly lit aisles full of sweating, questionable smelling geeks at a Big Apple Con when I came across a booth manned by a creator proudly selling his new book. I stopped for a minute to look at what he had to offer. The writer was so excited that energy radiated from him as he talked about his creation. He told me with great enthusiasm that his first couple issues had almost sold out and he was getting ready for another printing. The book looked all right, but I wasn’t particularly impressed and didn’t think it would go very far. As I walked away I filed the name of the book in the back of my mind along with other useless knowledge that’s stored away, waiting for the right moment to whip it out and show off my vast knowledge. That creator was Brian Clevinger and the book was Atomic Robo. Flash forward several years to a moment in one of my local comic book shops as I happened across several issues of Atomic Robo. Like a good little brainiac, I recalled the info I had stored away for just such an occasion, and investigated to find out what was going on with this book I had written off so readily. As it turned out, not only had the book survived, it had excelled, earning a highly coveted Eisner nomination in 2008. While not a mainstream book, Atomic Robo had managed to carve out a considerable fan following. I wasn’t quite ready to admit I was wrong, so I waited a few more months, but curiosity finally got the better of me, and I decided to check it out. Now I wish I had read this sooner. 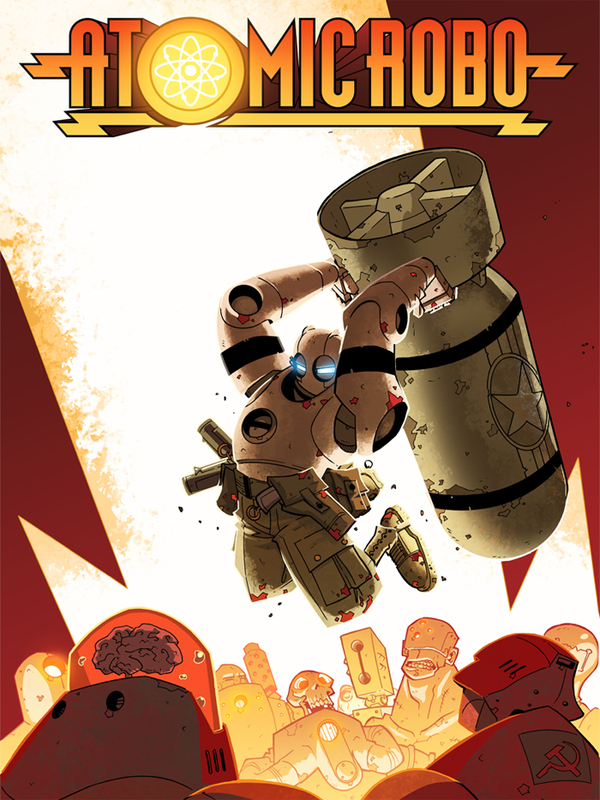 Atomic Robo feels like a cross between the humor, adventure, and energy of Indiana Jones and the simple art style of Hellboy. The first volume, Atomic Robo and the Fighting Scientists of Tesladyne is one of the funniest books I’ve read in a very long time. Throughout the book there is a wonderful sense of adventure. The stories in this first volume loosely follow the same plot line, following Robo, a sentient robot built by Nicola Tesla, and several adventurer scientists from Tesladyne Industries as they combat giant ants, mobile pyramids with robot mummies, and other things far too weird for the US government to handle. These stories provide a nice introduction to the world and main character. Along the way, the story arc occasionally takes humorous side roads into adventures with mobile pyramids and ancient death rays. My favorite story is the stand alone tale of how Robo receives a letter from the grandchild of one of his former WWII buddies who had died. It is a touching story about how an immortal robot deals with outliving his friends. What could otherwise be a tricky subject is told with grace and skill. Then the story just moves on, as it should. 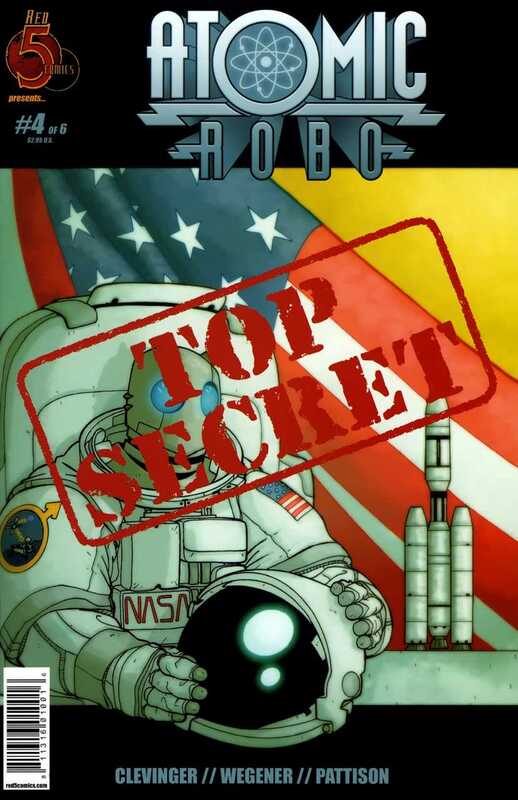 The book covers the first 6 issues of Atomic Robo and issues 1, 5 and 6 introduce a potential reoccurring villain in the amusingly stereotypical Nazi super-scientist Helsingard while issues 3 and 4 follow Robo to Egypt and a fabulous flashback to Robo’s “manned” mission to Mars. Each story is complimented superbly by the art, which is wonderfully simple and uses a vivid color pallet, reminiscent of Mignola’s Hellboy issues. Often, simple art styles run the risk of a lack of expression or emotion, but that is not the case with Scott Wegener’s art. Despite lacking most human facial features, Robo is able to convey a full range of emotions, which is a serious credit to Wegener. My only complaint with Atomic Robo and the Fighting Scientists of Tesladyne is that some of the action sequences were a little vague, sometimes making the progression from one panel to the next unclear. This is such a minor issue that it does not take away from the overall enjoyment of the book. So far Atomic Robo has completely surprised me in the best way possible, and I have to give it four and a half out of five stars. The first volume was funny and adventurous, and with 6 more volumes published so far, I cannot wait to jump back into this world and see what is in store for Robo and the gang at Tesladyne.